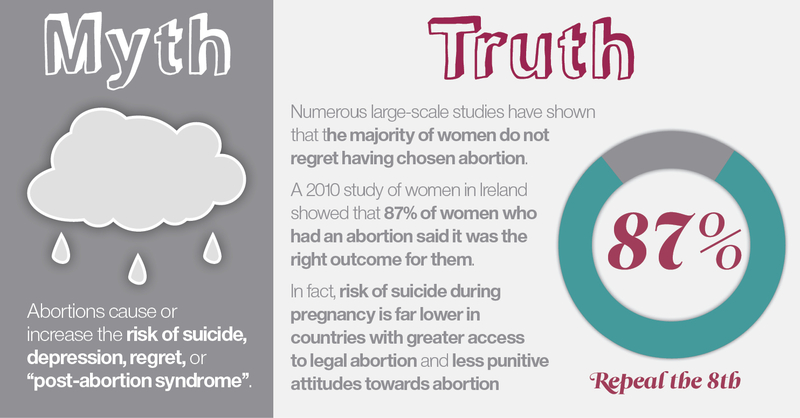 Myth #2: Abortion causes or increases the risk of suicide, depression, and ‘post abortion syndrome’. Truth #2: Women have plenty of feelings after abortion, and when they have real access to safe, legal abortion, they are not more at risk of emotional problems. It’s possible to regret having had an abortion, possible indeed to experience feelings of regret or loss afterwards. It’s possible to feel a sense of relief and closure after having an abortion. Similarly, it’s possible to regret having placed a child for adoption, having adopted a child, having given birth, not having given birth—or not having had the choice not to give birth. Such is the variety of human experiences and emotions. However, the notion that most or all women experience regret, anxiety, depression, etc., after having an abortion is not just shaky conjecture but also, according to the highest-quality scientific evidence available, untrue. The American Psychological Association (APA) and the Johns Hopkins University have both carried out separate large-scale reviews of research on abortion and mental health. Both established that the large majority of women don’t regret having chosen abortion. Research by the HSE’s Crisis Pregnancy Programme in 2010 showed that 87% of women in Ireland who had an abortion said it was ‘the right outcome’ for them. Significantly, restricting women’s access to abortion does provoke feelings of depression and anxiety and does increase the risk of suicide in pregnancy. This burden is merely exacerbated by the isolation and stigmatisation felt by those compelled to travel overseas for access to safe, legal abortion services. ‘Post-abortion syndrome’, a condition imagined and coined by American anti-choice campaigner Vincent Rue, is not recognised by any medical or psychological organisation. ‘PAS’ is listed neither in the Diagnostic and Statistical Manual of Mental Disorders nor the World Health Organization’sInternational Classification of Diseases, arguably the two most authoritative manuals that classify mental disorders. Why not? Because it doesn’t exist. See, for example, Nada L. Stotland, ‘Abortion and psychiatric practice’, Journal of Psychiatric Practice, 9 (2003), 139–49; American Psychological Association, ‘APA research review finds no evidence of ‘post-abortion syndrome’ but research studies on psychological effects of abortion inconclusive’ [press release], January 18 1989.